For those outside of law enforcement, a conversation among police officers may seem like you're trying to decipher an entirely different language. Law enforcement has its own lingo, police jargon, and ten-codes. But it's often the most efficient way of communicating and provides a sense of community among its users. It's widely accepted that ten-codes originated during the 1920s or 1930s, as police were beginning to use radios more and more for communications. The need for codes to keep traffic brief was recognized early on, and a series of code numbers for specific incidents was established. By most accounts, Charles Hopper, a communications director with the Illinois State Police, is credited with establishing the first set of codes. In early radio transmissions, the first syllable or so of a conversation was often cut off. Older radio systems had to warm up when the microphone was keyed. Officers were encouraged to pause a second between keying the mic and speaking. Saying "ten" before the numeric code helped ensure the message was delivered. There has been a push to move toward using plain English in police radio communications. The idea is that since there is no universally accepted list of codes, the use of plain language will better facilitate communications between different agencies and public service entities. At first, it may seem hard to decipher, even pointless, but police jargon and the use of police codes serve a purpose. Civilians may assume that the reason for talking in codes is so the public can't easily figure out what cops are saying. A quick internet search for police codes or police jargon, however, shows that most agencies make their codes public. The primary purpose of police jargon and codes is to keep communications short and concise. For one, Federal Communications Commission regulations require transmissions to be short to save bandwidth and make sure the airwaves are available for use. More importantly, police codes also serve an officer safety function. Whether they're on a traffic stop, at a domestics violence call or driving their patrol car, emergency mode or otherwise, an officer's primary focus needs to be on the task at hand and the subject or subjects they are dealing with. As much as possible, officers need to keep their interactions with police dispatchers as brief as possible so they can remain engaged in the incident they're dealing with. 10-8: This means an officer or unit is in service and available for calls. An officer will check on the radio or advise that they're ready for another call by "taking a 10-8." Conversationally, officers may use it to describe a suspect who fled from them, saying the suspect "got 10-8." 10-20: This refers to the location of an officer or call. 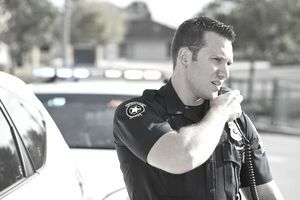 Some departments require their officers to provide their 10-20 whenever they initiate radio communications. Calls for service always include a 10-20, so the officer knows where to go. 10-4: This means "affirmative." It can be used to answer "yes" to a question or to advise that everything is okay. 10-13: This refers to the status of conditions. A dispatcher may ask an officer for her "10-13" to determine if everything is okay or if she needs help. 10-13 can also refer to weather conditions, crowd issues, or the status of a victim or suspect. In California, most departments use penal codes to describe calls. These "hundred" codes refer to the section of law the call corresponds with, such as "one-eight-seven" for homicide or "four-five-nine" for burglary. New recruits are often overwhelmed by the long list of codes they receive at the academy or in field training. Learning the jargon can be intimidating. The best approach is, to begin with, the realization that police jargon and codes are a different language, and like any new language, the quickest and easiest way to learn is to immerse yourself in it. It's one thing to look at a list of codes, but its far better and more effective to listen to other people use them so you can get a feel for the nuance of how the codes are used. If you're a new officer or current recruit, access a police radio and just listen. Keep it on in the background often in your free time to get a feel for how officers and dispatchers converse with each other. If you're thinking about working as a police officer or even a dispatcher, consider listening to online police scanners. In time, you'll find yourself fluent in the jargon, and you'll be able to hold your own in any conversation with another officer. You'll be one step closer to working in the perfect criminology career for you.